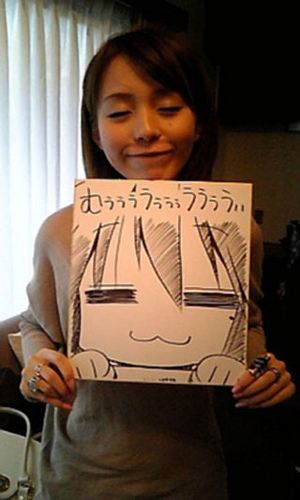 Hirano, holding a sketch of Konata Izumi from Lucky Star. Today, Aya Hirano announced via her twitter account that she would not be recording any more music. She stated on her twitter feed that her album, “Hysteric Barbie” was slated to be her last, but the decision was made to produce a Best-Of album soon thereafter. Now that both records are complete, she is done with music altogether. Details are sketchy, but she stated in April that she was prohibited from doing any more seiyuu work, but no mention of who told her to stop or why was made from it. Her notable seiyuu roles include Momo from Angel Tales, which was her first role, Konata from Lucky Star, Misa Amane from Death Note, Nanael in Queen’s Blade, and the titular Haruhi Suzumiya.